I am not familiar with Norton Ghost 15. However, I think I have done a full system image backup for the two required partitions for restoring my Windows 7. Those partition are C: Windows system and "System partition for booting". Now I am asking to know how I could let new and settings program to be backed up If they had done. So, is there any option for doing this in Norton Ghost? Will incremental or differential be merged with the full system image? Can an incremental or differential be for both system image/data backup? Differential backups were the next step in the evolution of backup strategies. A differential backup backs up only the files that changed since the last full back. For example, suppose you do a full backup on Sunday. On Monday you back up only the files that changed since Sunday, on Tuesday you back up only the files that changed since Sunday, and so on until the next full backup. Differential backups are quicker than full backups because so much less data is being backed up. But the amount of data being backed up grows with each differential backup until the next full back up. Differential backups are more flexible than full backups, but still unwieldy to do more than about once a day, especially as the next full backup approaches. I am expecting that I do a full backup on Sunday. On Monday I back up only the files that changed since Sunday, on Tuesday I back up only the files that changed since Monday, so on until the next full backup. If I had done a full backup on Sunday. On Monday backed up only the files that changed since Sunday, on Tuesday backed up only the files that changed since Sunday, and so on until the next full backup, Then I would have two similar backups. As long as I have an image backup which created on Monday, then why do I backup On Monday and Tuesday for the backup changed since Sunday ? Re: How can I do incremental or differential system image/data backup in Norton Ghost 15? Ghost does incremental backups and not differential. "I am expecting that I do a full backup on Sunday. On Monday I back up only the files that changed since Sunday, on Tuesday I back up only the files that changed since Monday, so on until the next full backup"
The "system reserved" partition does not change, you don't need to image that on a daily basis. But for your operating system partition you need to schedule an image every day and then set it to make a base image once a week. You will note that I have every day checked off up top. In the middle section I select "weekly" and then use the "Custom" button to set my full base image to be made on Mondays. The rest of the days of the week it will make incrementals with a new base image weekly on Mondays. Sorry, I didn't see your screen shot. Click "Tasks" and then "Run or Manage Backups"
Select "Define New" and then select "Backup My Computer" (Don't pick the file and folder backup). 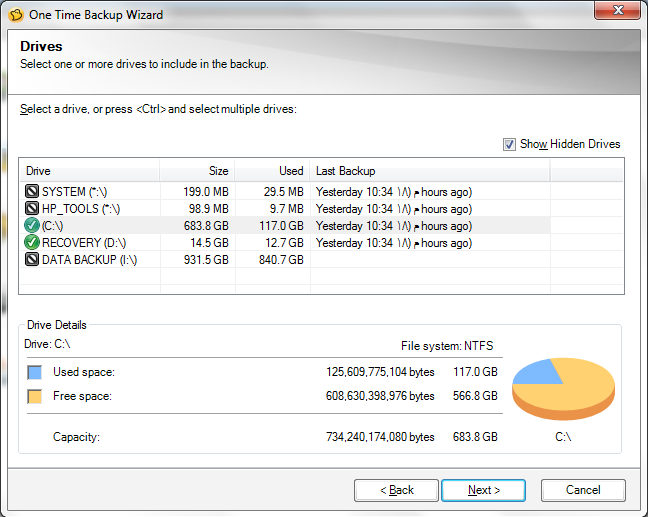 Then go through the wizzard and selct the partition you want to backup and where you want to keep the backups. You will see the screen I posted when you get to schedule. Thank you very much indeed. I would respectfully asking you about these two inquires: First: Why should I set my full base image to be made on Mondays or any other days? As long as I have made a full system image in the first time, this would be enough. So, I think that incremental is enough after doing a full system image in the first time. Second: When I have done the first full system image, I have selected the all the four partitions(C:Windows system, System partition, HP tools, D: Factory Recovery] So, my question is, if I have scheduled my full system image, would all of these partition be imaged in the time of schedule or only the C partition? I think that the C would be imaged for incremental backup. In addition, I would like to ask you that the system image I create from the bootable CD of Norton Ghost, will it be used with using bootable CD of Norton Ghost. In other words, I have done a system image with booting with bootable CD of Norton. But When I want to use it, should I use this bootable CD for Norton to restore my system if I need? 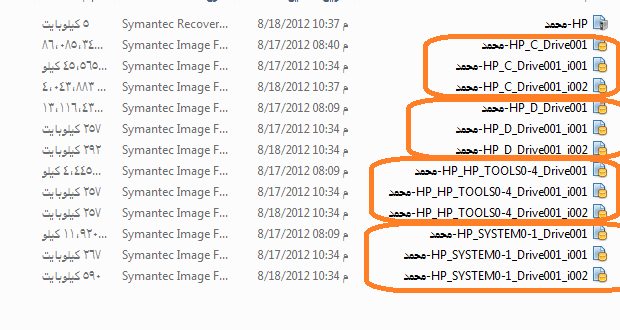 When I have done the first full system image, I have selected the all the four partitions(C:Windows system, System partition, HP tools, D: Factory Recovery] So, my question is, when the schedule time has happened for my full system image, I noticed all of these partitions have been imaged in the time of schedule and not only the C partition? I think that the C would be imaged for incremental backup as long as that the changes would be on it. When the time of sechdule reached, the Norotn backups an incremental for all the pratitions. I am not sure that the information is the same or not, because only took a little time. Could anyone please reply me to close this pending issue? .v2i is a baseline partition image. Each .iv2i relies on the previous one all of the way to the original .v2i file. If C_Drive001_i001.iv2i was damaged or deleted, C_Drive001_i002.iv2i and C_Drive001_i003.iv2i are no longer useful. The .sv2i file tells Ghost hoe the partitions are laid out during recovery. It isn't really needed. Firt: if C_Drive001_i002.iv2i was damaged or deleted, are C_Drive001_i003.iv2i and the next other ones no longer usefu? Second: as lon as C: is only the partiton which changes, If I want to step the incremental backups at least for the partitions which don't change, such 'D', system, and HP tools, how can I do? Third: How can I restore my computer from this image? Finally: First: Why should I set my full base image to be made on Mondays or any other days? As long as I have made a full system image in the first time, this would be enough. So, I think that incremental is enough after doing a full system image in the first time. I cannot see the picture yet. but see my comments in red. First: if C_Drive001_i002.iv2i was damaged or deleted, are C_Drive001_i003.iv2i and the next other ones no longer useful? Correct. That is why you don't want to go forever without starting a new baseline backup. Second: as long as C: is only the partition which changes, If I want to step the incremental backups at least for the partitions which don't change, such 'D', system, and HP tools, how can I do? For the partitions that do not change, I would just do a one time backup and keep the backup files safe somewhere. You boot from the SRD (Symantec Recovery Disc) and run the restore wizard. This is personal choices. I start a new baseline image at the beginning of the month and do incrementals nightly. I schedule my backups to run at 7:00PM because I know my PC is usually on at that time. Again, you should start a new Recovery Point Set periodically because id any in the chain becomes corrupted or deleted, everything after it is useless. First: I have been seeing the screenshot very clearly. A- as you know that always when you choose to make a defined new backup to your computer by choosing 'define new backup', and then you selected partition C , the partition "system" is automatically selected. So, how can I do if I want let 'system' is backed up as a one-time backup? 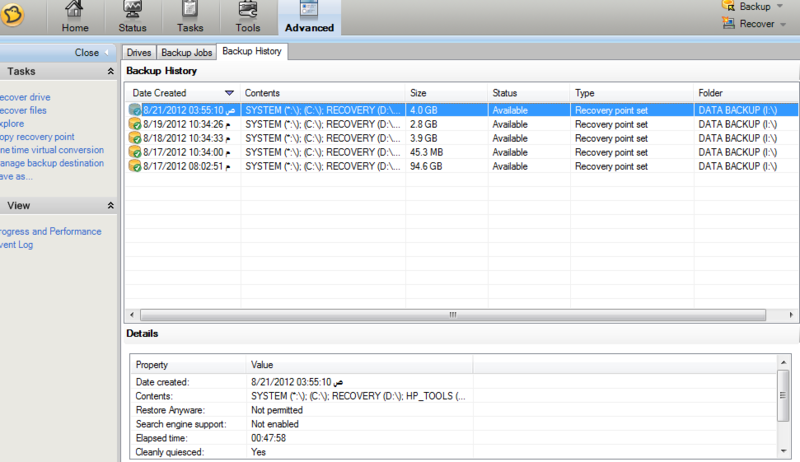 B- If I have made a one-time backup for the (HP tools and D system), and scheduled backup for 'C and system' partitions. Thus, how can I will restore these three separated images? I have been expecting that while booting from the Symantec Recovery Disc, I will only select one image file to restore my computer. C- When I have run a one-time backup, I have seen that that D,C are alread created, although I only have run define new backup ( have you a look at my screenshot below) So, how can I do a one-time backup as long as it is already created? Third: how can I created this disc, especially while I don't have the the downloaded file for it? A- Do you think that this CD is similar to (Symantec Recovery Disc), if no could you let me know how can I download Symantec Recovery Disc .iso file? C- When I created a full image for all the four partitions with Bootable Norton Ghost Disk, and then I didn't see that Installing Norton Ghost recognize this image. Again, you should start a new Recovery Point Set periodically because id any in the chain becomes corrupted or deleted, everything after it is useless. Fifth : What do you mean with "start a new Recovery Point Set periodically". Do you mean that I do new defined backup for the which changes. Then, I have created 'a new defined backup', I would delete all the previous to keep space on my hard disk. A- As you know that each time of the scheduling, there will be a backup file added for the the partitions scheduled, so there would be too many files to choose from them while restoring. Thus, a user would be quite confused. B- Do you not think that a user would be recommend to create a one-time backup for all the partitions he wants and then he wouldn't get corruption or deletion for it. Especially when he saved on a CD/DVD? You can see the picture you uploaded immediately. The rest of us have to wait until a moderator approves it. What I meant by not going forever without starting a new baseline is starting a new Recovery Point set. If you only have one v2i file and a chain of iv2i files, say 100, what do you do if the second iv2i file is corrupted? Everything from that point on is no longer usable! I start a new Recovery point set monthly and verify all backups. You have the one time backup wizard shown in your image. Since you already made a backup of those partitions, I would just keep it and modify the backup job to remove them from your schedule. Advanced Tab > Backup jobs tab > right click > edit settings. The disc you booted from is also the SRD. 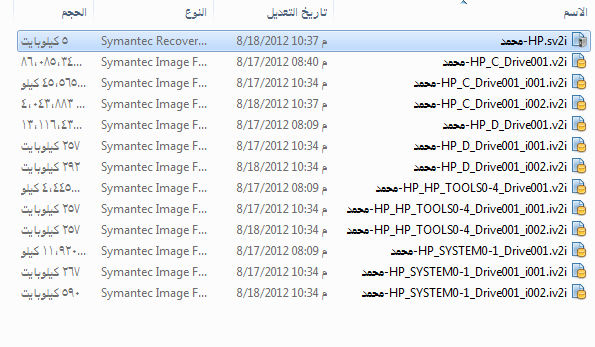 It is used for recovering partitions or even files / folders from an image. It is also used for cold backup.. 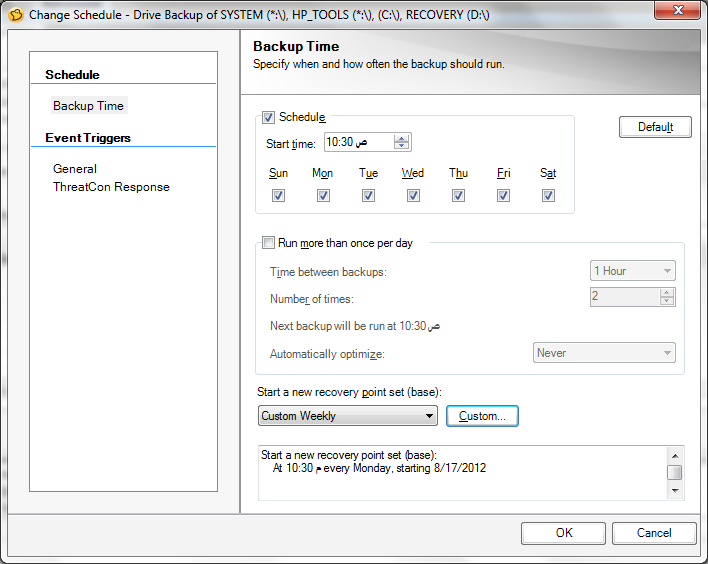 When you create a backup schedule there is a place that lets you choose when a new Recovery Point set starts. It defaults to monthly. You can set weekly, monthly, quarterly or yearly. I like monthly and keeping several months recovery points available just in case something happens to one of them. I have about 6 months worth now. I hate trusting optical media. I trust a hard drive more. If you must use optical media, make sure you use quality media like Taiyo Yuden. Make an extra copy and check them for errors every so often. First: But when I booted from SRD, I did never see the image I created with the installing Norton Ghost was available in that destination when I navigated to. Note: the bootable CD of Norton Ghost I have been owning is Semantic Ghost 11.0. Copyright (1998-2006), So maybe it is the reason that the images created with installing Norton Ghost weren't accessed. Thus, Could you let me know how can download the latest one? Second: I can created a system image for my computer during 'Bootable CD of Norton Ghost, don't I? 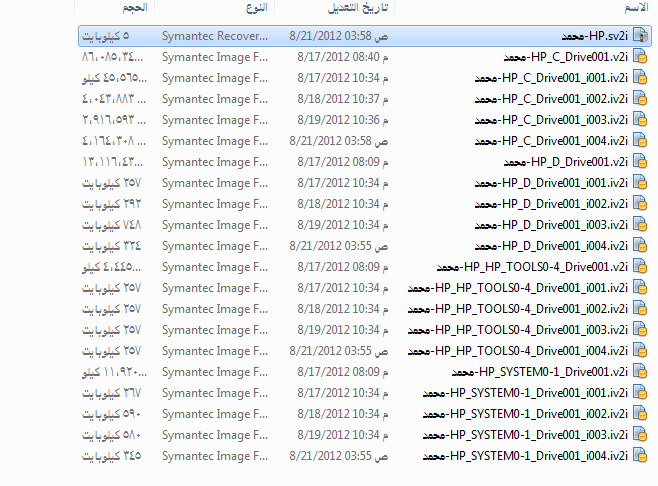 Third:I have noticed that the system images created during SRD, I cannot access them during installing Norton Ghost. Also, the system images created during installing Norton Ghost cannot access them during SRD. I have really set up the new base backup every Monday when I have run 'define backup wizard' in the first time. Fourth:: But I am really beginning to hate this way is going on, because there is one backup file added in each scheduling time Comes. So, if you have a look at this picture, you will see that the files(iv2i) became four for each partition. Thus, my partition will soon get full even if it 1000TB. Fifth: Besides, if I want to restore my computer from this image, should I see all of these files while booting SRD? Sixth if you see my screenshot below, you will see that the last Recovery Point set(It is an automatic backup) is 4GB, although I didn't installing other than Someone browser, which its size will not exceed 20MB. Finally: I think even If I have deleted all the iv2i files, I still have v2i file for each partition, so this would restore my computer to the state on which it was when I have created the base backup. However, I only lost the settings done after this Base backup whose file is "V2i". Could you you please reply me to close this isseu pending? I was hoping someone else would chime in. I thought I answered most to the best of my ability. Anything in particular without making me re-read the whole thing?